You’ll have to look hard to find a bench on a beach volleyball court. In juniors beach volleyball there’s not an outside, middle, or defensive specialist — just you and your partner to cover the entire court. A coach does not determine playing time. There is no specializing or substitutions. Each player must master passing, setting, and hitting to be successful. Beach volleyball provides advancement of your indoor game, as well as, collegiate scholarship opportunities. As one of the fastest growing collegiate sports, there were 99 beach volleyball teams last year. Of the 99, 55 schools were NCAA I and 11 were NCAA II. Both offer beach volleyball scholarships — a NCAA National Championship sport. Summer Juniors Beach Information Coming Soon! 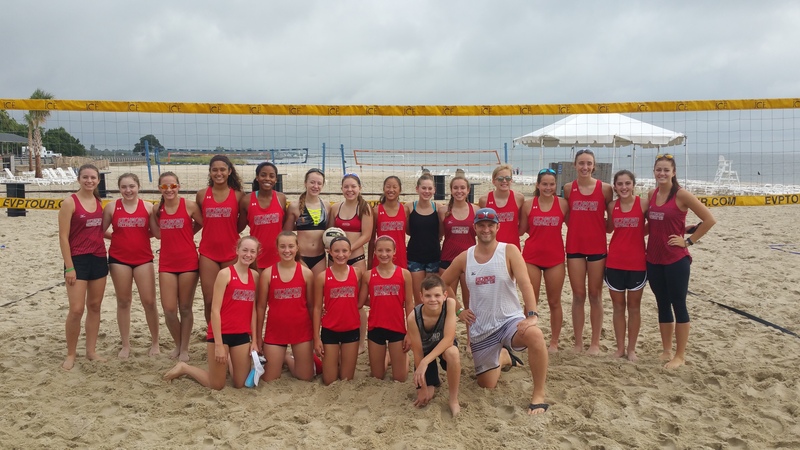 Have questions about juniors beach volleyball? Join us for an Informational Meeting on March 26th at 7:00 PM at our Byrhill Gym to learn more about the program. It’s time for some fun in the sun! Hop on over to Richmond Volleyball Club and sign up for the Jumpin’ Juniors Beach youth volleyball program. If they haven’t played volleyball before – no worries! No volleyball experience or knowledge necessary. This is a fun and easy way for boys and girls ages 10-13 to learn volleyball while enjoying the outdoors on a sand court.